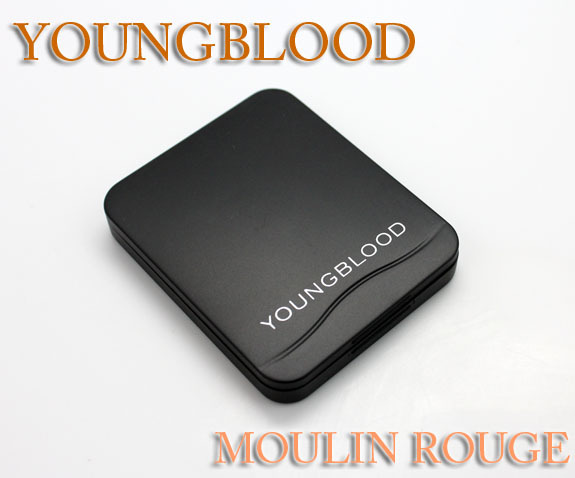 This fall, Youngblood Mineral Cosmetics introduces us to the Moulin Rouge Pressed Mineral Eyeshadow Quad. 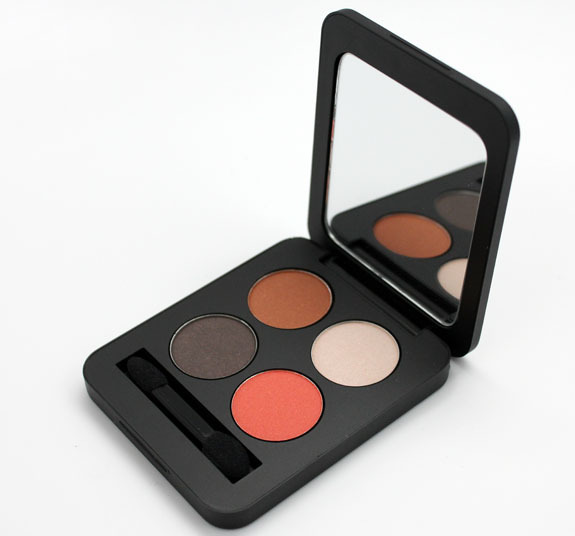 Also inside is a large mirror and dual-ended eyeshadow applicator. Can-Can is a medium caramel colored warm brown with shimmer. Gorgeous shade, nice pigmentation. Revue is a pearly vanilla/white. Great as a highlight shade. Red Light is a very slightly pearly and bright warm orange/red. Love the intense color of this one. Cabarets is a very dark brown with tiny red shimmery bits. Not patchy, very deep and pretty, but you won’t really see the red shimmer on the eye much. I can’t think of another eyeshadow palette that screams “fall” to me more than this one. Can-Can reminds me of cinnamon and caramel. Red Light reminds me of the bright changing leaves of the Japanese Maple Tree in my backyard. Cabarets reminds me of a cozy pair of dark brown boots. Sigh. I am craving fall lately. Pricing: $43.00 for .14 oz. 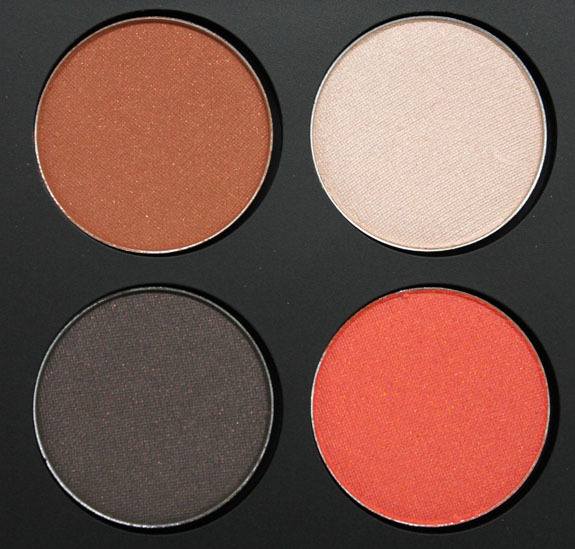 Do you like these warm fall shades? Note: Youngblood is cruelty free. These are beautiful! Red Light is stunning, such a unique shade. Yay, a fall palette! Red Light is gorgeous, doubt I could wear it though. Hmm these are nicely pigmented but I’m not too hot on the price. These definitely spell harvest to me. 🙂 They’re nice, but I feel like warm fall shades don’t always look the best on me. Hmm…the price is a bit too high for me as well. 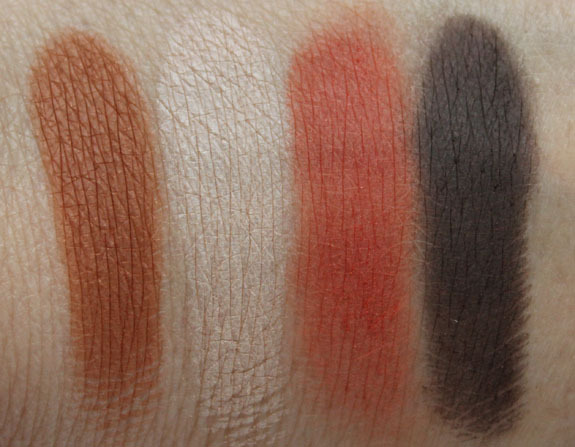 However, I love being able to see swatches of shades that I might not have seen otherwise. Thank you for sharing, Kelly! 🙂 Hope you have a great weekend! Wow! These are gorgeous colours, and you’re right- utterly perfect for fall. I’ve never heard of this brand before, but this makes me want to try them! The price is a bit steep, but what a beautiful and unique combination of colors! I haven’t seen anything quite like this from any brand so far this Fall. Truly breathtaking. Ok I love the movie Moulin Rouge and I love these colors. I may have to bite my tongue and order this! What sleek, cool packaging. I’d love to see how you would wear these! It’s too bad the shimmer doesn’t show up in Cabarets. WOWZA! Unique colors with great pigmentation! I question the price a bit, but it’s a beautiful set! i would get it if it was cheaper 🙁 but oh that red is pretty!